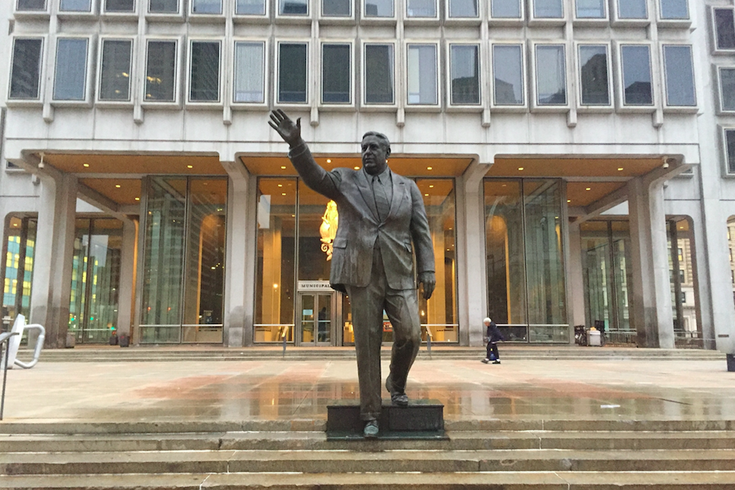 The spray-painted phrase "black power" was removed from a statue of former Philadelphia Mayor Frank Rizzo after a vandal defaced it in August 2017. A Philadelphia school teacher was charged Saturday after he allegedly made terroristic threats against a police officer during a protest at the Frank Rizzo statue last week, according to multiple reports. John Sheerin, 63, of Crescentville, was arrested without incident Friday night and charged with terroristic threats and harassment, Philly.com reported. Sheerin was among a smaller group of protesters that stayed downtown after the larger "Philly is Charlottesville" rally on Aug. 16 and demonstrated against the statue memorializing the late Frank Rizzo, a former city police commissioner and mayor. As protesters encountered officers stationed between them and the statue, Sheerin allegedly made verbal threats of violence against an officer, sparking his arrest over a week later, Philly.com reported. Sheerin was most recently a teacher at Julia De Burgos Elementary School in North Philadelphia, according to reports. District spokesman Lee Whack told NBC10 that the school had already been investigating Sheerin, and that Sheerin would not return to the school pending the investigation. "The safety of our students and staff is our highest priority. This is a matter which we take very seriously," Whack told the news organization. "The School District is aware of his arrest." Sheerin was released on $5,000 bail. He is due in court for a hearing on Sept. 26, NBC10 reported. Asa Khalif, a Black Lives Matter Pennsylvania member, called Sheerin a "true soldier in the fight for justice" in a Facebook post Saturday. Questions over the Rizzo statue's perch outside the city's Municipal Services Building on JFK Boulevard, across from City Hall, have grown loud again after Councilwoman Helen Gym called for city officials to take the statue down in response to the recent violence in Charlottesville, Virginia. Rizzo rose among the ranks of the Philadelphia Police Department before being named city police commissioner in the late 1960s, and he served as mayor from 1972-80. But opponents of the monument claim it symbolizes police discrimination and brutality against people of color and the LGBT community during Rizzo's time.